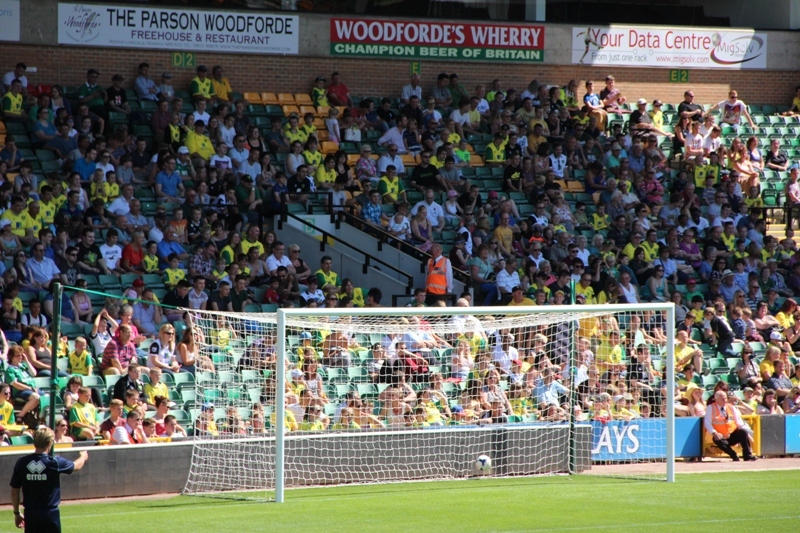 Norwich City fans (including myself) were treated to an inside look at the new signings for the club, as they trained at Carrow Road in the glorious sun. Anglian Home Improvements was invited along as we continue our partnership with the Canaries, sponsoring the Man of the Match and the Player of the Month. The morning started with a quick interview by Chris Goreham with Norwich City Chief Executive, David McNally. He told us all how the club has progressed, consolidated debts and is driven to continuing the success of the club by buying good quality signings at the right price. It is not just on the pitch the club is improving, they are working more efficiently behind the scenes, improving facilities around the ground and at Colney, their training area. The club has seen seven new faces join following two successful campaigns in the Premier League, with Martin Olsson joining from Blackburn, experienced goalkeeper Carlo Nash signing a contract, England under 21 international Nathan Redmond moving from Birmingham, Javier Garrido signed a permanent contract after a successful loan last season, Dutch internationals Leroy Fer and Ricky van Wolfswinkel joined and most recently Gary Hooper. Chris Goreham, who commentates the Norwich games for Radio Norfolk (you should tune in, he is a brilliant, animated commentator! ), then interviewed first team manager Chris Hughton. Norwich City have just returned from a tour of the USA, which they used primarily for fitness, which Hughton said was a great tour and gave them a lot of good fitness work. Despite losing to San Jose Earthquakes and Portland Timbers, Chris Hughton was happy with the performance levels and was thrilled to have beaten Dorados 3-0. When asked about how to keep team morale high when there are so many new faces joining he said it wasn’t too difficult as the current squad are a great bunch and that the new lads are always welcomed into the team. Manager Hughton then went off to start the open training session, giving the 200 strong crowd of Norwich fanatics an insight into the drills the team do, how the new signings are fitting in and see some of their favourite players in action. As manager of Anglian Knights, it was great for me to see how the team trains and I got some great tips for what to do in our pre-season to help the team improve. It was also even better to see the new look Norwich squad, in particular Ricky van Wolkswinkel who I have been eager to see play in a City shirt since he joined the club. There is a lot of hype building up in the media as McNally and Hughton’s new acquisitions have been not only quality players, but also bought at good prices. van Wolfswinkel has quite a goalscoring record and the young Dutch international was highly sought after, but it is Gary Hooper, I think, who will be a dark horse of the campaign. Norwich tried to sign him in January from Celtic, but were not prepared to pay more than necessary. The proven goalscorer in the lower English leagues and the Scottish Premier League may just be a secret weapon for Hughton, and although some people may doubt that he can cut it in the Premier League, I think he will be a great success. For me the most exciting signing of the Summer so far is Nathan Redmond. The England under 21 international is a bundle of talent, quick on the ball and quick on his feet. Like Raheem Sterling of Liverpool or Alex Oxlaide-Chamberlain of Arsenal, I think Redmond will shine this season, giving healthy competition for Snodgrass, Pilkington, Elliot Bennett and Hoolahan.